Provide your valuable products double protection with these double wall cardboard boxes. 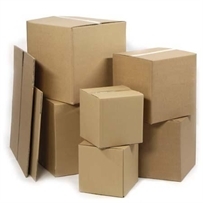 These are heavy duty cardboard boxes and made from double wall cardboard with two layers of corrugated paper . They are generally suitable to ship heavy items and long term storage. Complete range of double wall boxes are available in this section.